Garlic Chive Butter Shrimp Pasta - easy delicious pasta loaded with garlic chive butter shrimp. Weeknight dinner is a breeze with Mauviel saute pan! 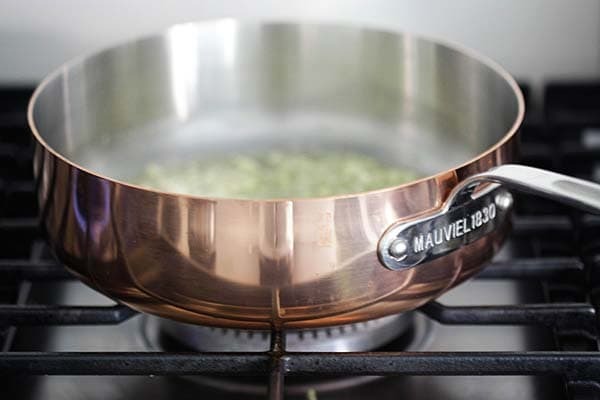 I have a soft spot for beautiful cookware, especially the ones made in France, so you could imagine just how thrilled I am to be working with Massdrop to review Mauviel M’150 Copper Saute Pan with Glass Lid. Mauviel is famed for its unsurpassed quality and elegant design since 1830. Its cookwares are made in France and preferred by professional chefs and home cooks alike. The products are backed by a lifetime warranty. As soon as I received my Mauviel M’150 Copper Saute Pan with Glass Lid, I immediately put it to good use. First of all, I just love the copper exterior and its sturdy design. The stainless steel interior is deeper than regular saute pan, which makes it versatile for a variety of dishes, for examples: simple saute of meat and seafood, vegetables, and pasta dishes on those busy weeknights. The glass lid and long handle complete the elegant look. To test drive the saute pan, I decided to make this absolutely delicious Garlic Chive Butter Shrimp Pasta. All Mauviel pans are safe for oven cooking, making roasting a breeze. My recipe calls for a two-step process; first, I lightly sauteed the garlic and shrimp, then I roasted the shrimp in the oven for a few minutes. After that, I stirred in the spaghetti for an easy pasta meal. What I love most about the pan is that it’s made from 90% copper, which is 10x more conductive than steel. Food cooks faster as it heats more evenly compared to other metals, while the stainless steel interior won’t affect the flavor of the food being cooked. It took me about 1 minute to melt the butter, saute the garlic and shrimp, before I transferred the pan into the oven for roasting. Weeknight dinner is easy peasy with Mauviel Saute Pan. Other than the Saute Pan, this range of products also include the sauce pans of different sizes. With holiday shopping coming upon us, remember to add Mauviel to your wish list. Happy shopping! Disclaimer: This is a sponsored post by Massdrop. The opinions and text are all mine. Garlic Chive Butter Shrimp Pasta - easy delicious pasta loaded with garlic chive butter shrimp. Weeknight dinner is a breeze with this recipe. Rinse the shrimp and pat dry with paper towels. Set aside. Heat up a pot of water and bring it to boil. Cook the spaghetti according to the package instruction until al dente. Drain and set aside. Heat up the Mauviel Saute Pan on medium heat. Add the butter and melt it. Add the garlic and saute a few times. Add the shrimp, salt, dried chili flakes, chicken broth, white wine, lime juice and chives. Stir to combine well before transferring the pan to the oven. Roast the shrimp for 5 minutes or until they are cooked. Remove the pan from the oven and add the spaghetti to the shrimp. Use a tong to combine well. Top with the grated Parmesan cheese and serve immediately. You can choose to cook the shrimp on the stove top instead of roasting in the oven. Skip the oven step if you wish to do so. Just cook the shrimp for a couple of minutes or until they are cooked before adding the spaghetti. All photos and recipes on Rasa Malaysia are copyright protected. Please do not use the photos and recipes without prior written permission. If you wish to republish this recipe, please rewrite the recipe in your own words instead of copy and paste and link back to //rasamalaysia.com/garlic-chive-butter-shrimp-pasta/. Thank you very much! Yes you can. You can cook the scallops about the same time as shrimp. I have made this dish before; too bad I liked it so well; made at least once a month since ! You will Love it ! Look your shrimps make me craving. Plus I like garlic chive butter a lot. Cant wait to try this recipe! Wow! The colors are so vibrant – your photography is fantastic! 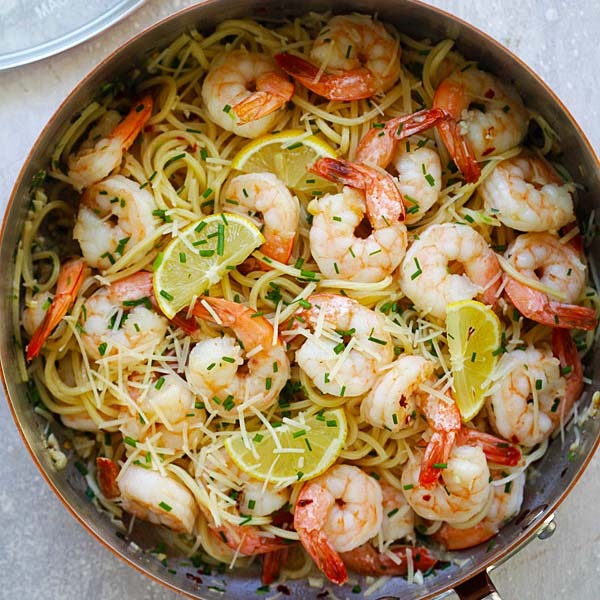 ​Garlic chive butter shrimp pasta looks delicious. I would try making it​ for sure cuz i prefer healthy food! Thx for unique recipe! Hi Jill, yes, this pasta is very good! Mmm! 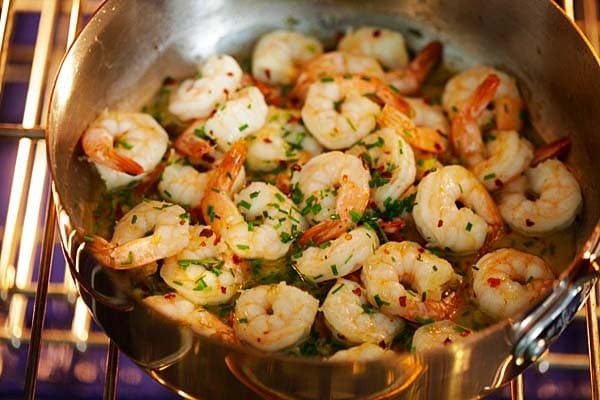 My sister loves shrimp– will have to make this for her. I’d like to try this, but instead of the chives I want to use some of the fresh herbs I’m growing. I have parsley, dill, thyme, basil and rosemary. What would you recommend? You can use parsley or basil. This Garlic chive butter shrimp pasta looks so zesty and tasty! Absolutely love your creative idea! Thanks for sharing!